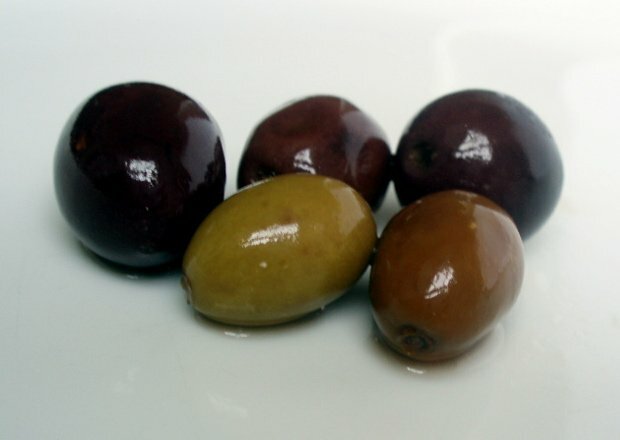 Black olives are simply green olives that have been left longer on the tree to ripen further. Mixing olives can be one way to divert attention away from less flavourful specimens, but done skilfully using hand-picked olives and well-made marinades, you can achieve a bowl full of interesting and complementary flavours. Lovely soft olives and fresh herbs mark out Osmin's treatment. From further south in Italy, between Rome and Naples, these uniform, mid-sized brown, purple and even blueish olives are sweeter and perkier than the Taggiasche, with a firm flesh and a milder flavour. Large enough to be worth pitting, they offer a great savoury punch to pasta or on pizza – the black olives you often get on pizza are green (ie young) olives, artificially coloured. Squash ball-sized olives like these offer plenty of options for stuffing: commonly, a strip of lightly peppery pimento paste, but sometimes garlic, nuts, cheese, anchovies or sun-dried tomatoes. Generally olives are a great foil for contrasting tastes and textures: here the capers offer a salty bite that gives the green olive a deeper, more rounded flavour. The best known of all black olives, from the Messina valley of the Peloponnese peninsula in Greece, Kalamatas have a distinctive pointed shape and a russet, purpley brown tint from their traditional red wine vinegar cure. They have a rich and beautifully balanced but not intense flavour, firm flesh and are long and easy on the palate. A great eating olive. Big, fat, pale green olives from Granada in Spain, one of the main producers of eating olives. Green olives are picked before they're ripe and are inedible raw, so are matured and fermented in oil or, more commonly, brine. This curing process leaves good olives like these with a tart, fruity freshness and a good bite to them, but underdone they'll be crunchy and still too bitter. Tiny, pebble-sized, savoury, mixed black, brown and beige olives from Liguria in northern Italy. Unlike many eating olives these also make excellent olive oil, and the oily nature of the fruit gives it a deeper, more mature flavour and a lovely sensation in your mouth as the flesh peels away easily from the smooth stone. There's not much to each one, but they're packed with flavour.